1 of 8 Heat broiler. 2 of 8 In a glass pie plate or small dish, combine the chopped garlic, olive oil and salt. Add chicken; turn to thoroughly coat the chicken. Arrange the chicken tenders in a single layer on a broiler-pan rack. 3 of 8 Broil the chicken about 4 inches from the heat for 3 minutes. Turn chicken tenders over with with a set of tongs. Continue to broil until cooked through, about 2 minutes. Remove the chicken tenders from the broiler. Leave the broiler on. 4 of 8 When chicken tenders are cool enough to handle, thinly slice them. Set aside. 5 of 8 Arrange the pita rounds, rough side up, on baking sheets. 6 of 8 Toast the pita rounds under the broiler until barely golden around edges, 30 to 45 seconds. 7 of 8 Spread a generous 1 tablespoon tomato sauce over each pita. Top each pita with the sliced chicken tenders, dividing equally. 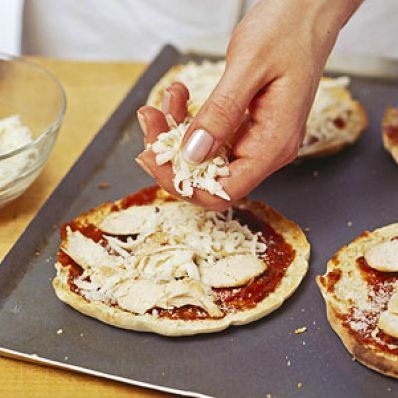 Sprinkle each pita with 1/2 tablespoon grated Parmesan cheese and very generous tablespoon of the shredded mozzarella cheese. 8 of 8 Broil the pizzas about 4 inches from the heat until the mozzarella cheese is just melted, about 1 minute. Let pizzas stand a few minutes before serving.